I hope you are getting excited about the start of Idaho's ski season. After yesterday touring and skiing, I am psych-up and eagerly waiting for more snow forecasted for this weekend. 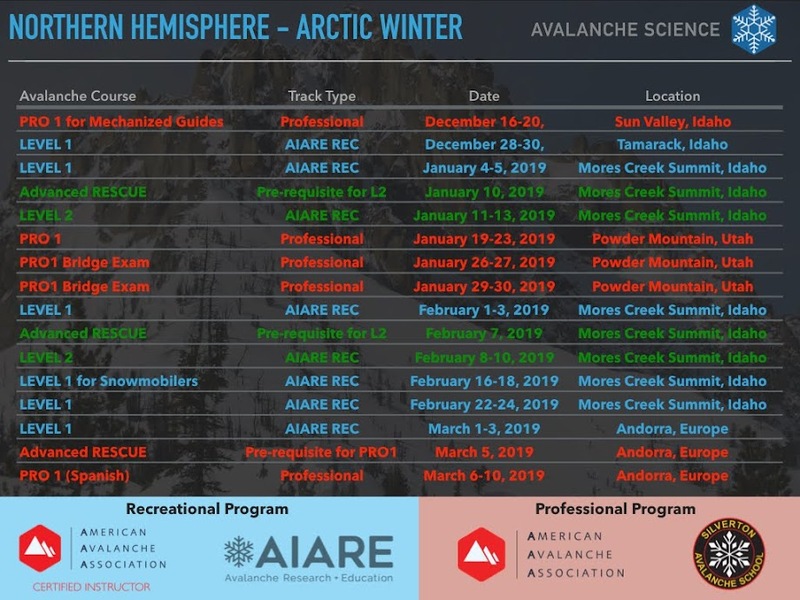 The reader needs to keep in mind that early winter snow conditions are challenging due to the snowpack high spatial variability and notorious advanced facet formation. Last year posting is a good start, but I am sure you will best appreciate a "show and tell" approach. So, lets run through some fundamental steps that will prepare us for skiing this weekend. The Weather forecast links are included below. The first link offers an interactive map where you can you choose your area of interest. Also include for your convenience, the NOAA links for Mores Creek Summit and Banner Summit. First, the abbreviated graphical forecast for Copper Mountain at Banner Summit predicts a 80-90% probability of snow with cold temps. Sounds like POW! 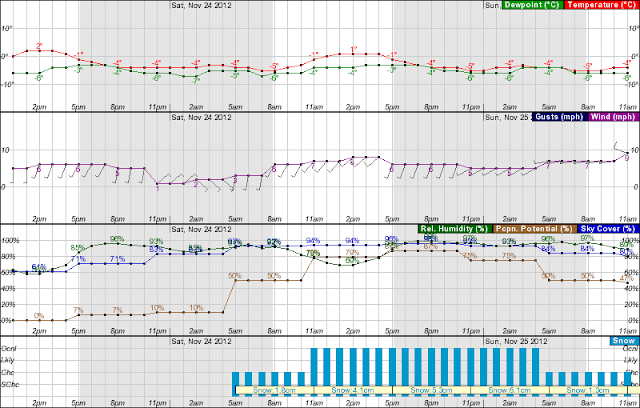 Wx Forecast at noon for friday November 23rd, Copper Mountain, elevation 7500 feet. The forecast details that the precipitation event starts early Saturday and tapper down a little more than 24 hours latter. The 24 hour total precipitation forecasted at 7500 feet is less than 20 cm of snow. Winds light and out from the SW, however they are close to the 10 mph threshold of Moderate winds, where snow transport becomes concerning. The precipitation temps are mild during during Saturday (-1 to +1 Deg-C), but cool down as the precipitation continues overnight. 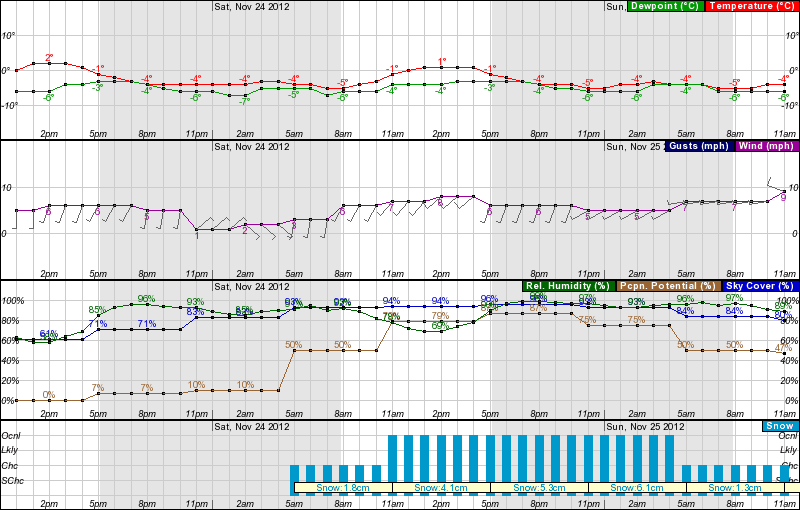 The winds shift from the NW as the front passes the area by Sunday at 11 AM. Other valuable information is available at the NOAA Wx site, such as IR maps, Radar of precipitation, and the forecast discussion. You should get familiar with those products as well, but I will not cover them for the sake of keeping this posting brief. Central Idaho, and what it looks like Banner Summit, seem to have a 70-80% of getting more than 4 inches in 24 hourd period. In other words, Banner Summit seems to be the region where MOST of the snow is expected to precipitate! Next we want to KNOW, what the regional forecast centers are predicting for Avalanche Danger. It is somewhat early for the Avalanche Forecast offices to publish the danger rating. Please continue to check the avalanche centers trough-out the weekend! I will comment later in the posting, how you should treat the current conditions. Based on the weather and avalanche forecast make a plan of where you can SAFELY travel and ski, NOT where you want to go. 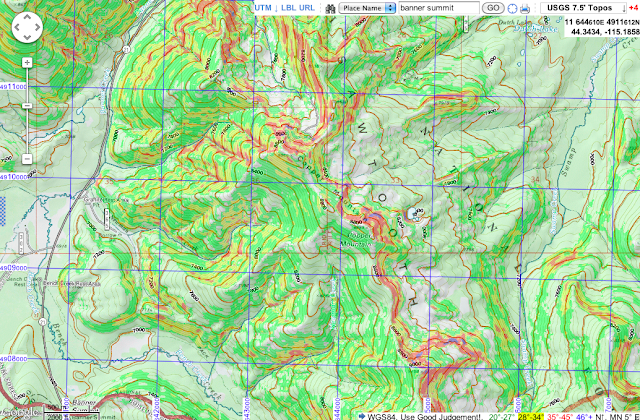 The best approach is to use Topo Maps to plan your snow travel. This web tool also provides the means to map average "MACRO" slope steepness, where the slope angle can be selected. 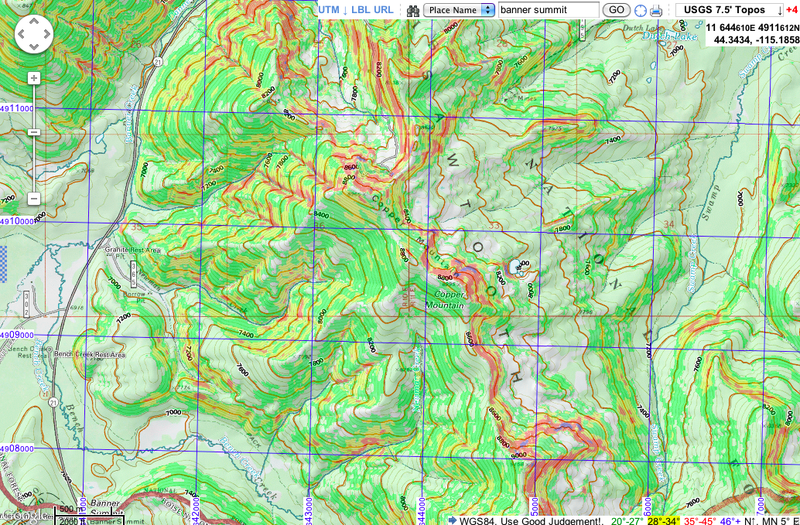 There is another fabulous website with even more elaborate topo maps features such as the superposition of 40 feet contours, slope angle, as well as UTM coordinates. The topo maps links and functionality listed above will allow indivduals to plan what slopes to avoid during the present conditions, and where to set the up-track and the ski down paths. Please use this web tools, or buy mapping programs for your PC, GPS, and/or powerful phones. So we are are back to present snowpack conditions at SW Idaho, and the best data I have available for making inferences is from Pilot Peak snowpit last Thanksgiving Day. The "Thanksgiving" snowpit was located to the West of Pilot Peak at an elevation of 7930 feet, in a northerly aspect with a 20 Deg East aspect, and at a slope angle of 20 degrees. The snowpit site was not wind loaded and well protected from the elements (sun effect and/or wind erosion). In fact the site was selected to maximize the chance of checking the stability of the recent snow in top of the October old snow. The October snow consolidated into 10 cm of "knife" hard melt-freeze layer, and no basal facets (depth hoar) were detected between the ground and the melt-freeze layer. Above the old "knife" melt freeze layer there is a 5 cm thick layer of 2 mm facet grains, overlaid with a 30 cm slab with hardness ranging from "four finger" above to the weak layer to Fist hard at the surface. This weak layer is reactive to Extended Column Tests (ECT) and compression tests (CT), with ECTP7Q1(SC) and CT11Q1(SC) scores. The SC stands for sudden collapse, which is characterized as a Q1 score. The video with ECT test included in yesterday's posting is posted again to avoid first time readers of this latest post to have to go to a previous posting. Again, notice the sudden collapse of the entire extended column. Two Compression Test (CT) produced CT11Q1(SC) at the 35 cm weak layer. The next picture shows the 30 x 30 cm column prior to the CT test. Notice how the sides of the compression column are cleared to eliminate interference at the sides of the column. This is an important detail to reliably evaluate slip likelihood (Q1 scores) after the triggering and propagation of a fracture failure. The PST Results were PST10/100 (SF). Check the slab fracturing prematurely in the video included below. PST results can be unreliable for thin slabs, due to the Slab Fracture phenomena. Performance of PST testing improves for thicker slabs. The ECT test results at a snowpit location where basal ice layer is thinner and less uniform it does not shows propensity to fracture propagation. This was anticipated, although it is nice to verify it . The results for this test are scored as ECTN12. A second weak layer was identified 20 cms from the snow surface. It is an extremely thin layer of large and long faceted crystals (maybe a variant of planar surface hoar crystals). This failure was clearly observed when doing the shovel tilt test and it failed with easy scores (5 deg tilt). The slab above this weak layer (SH?) slides off, and can bee seen in the third video included above. So how do we use all the information gathered in the study snowpit at Pilot Peak? 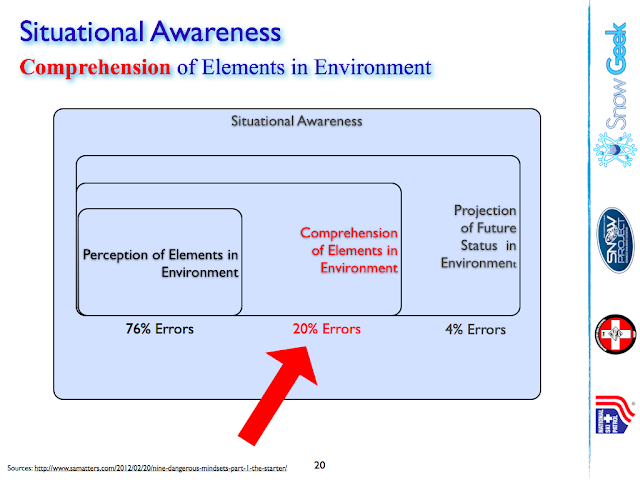 We discussed in the previous posting the importance of perceiving the environment in order to avoid 76% of human errors. Situational Awareness when traveling in avalanche terrain is facilitated by the use of the stability quadrants. 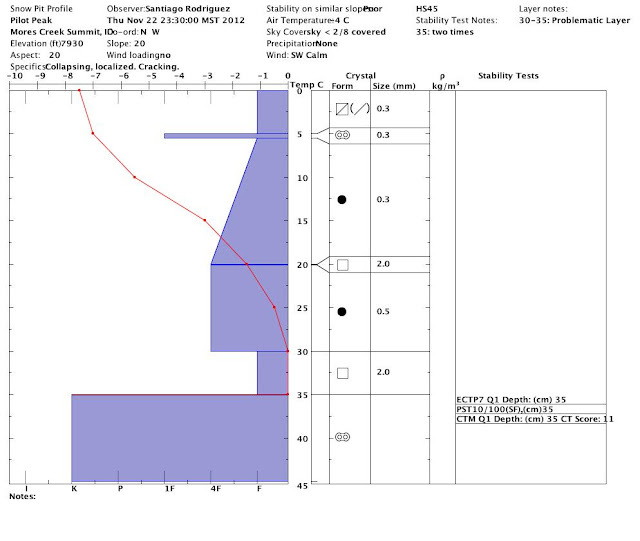 The stability quadrant methodology suggested a high likelihood of triggering and propagating a fracture failure, as well as a likely slab slip in terrain steeper than 35 degrees. The stability quadrant also quantifies the structural weaknesses responsible for slab avalanches, and characterized as a poor and concerning snowpack structure. 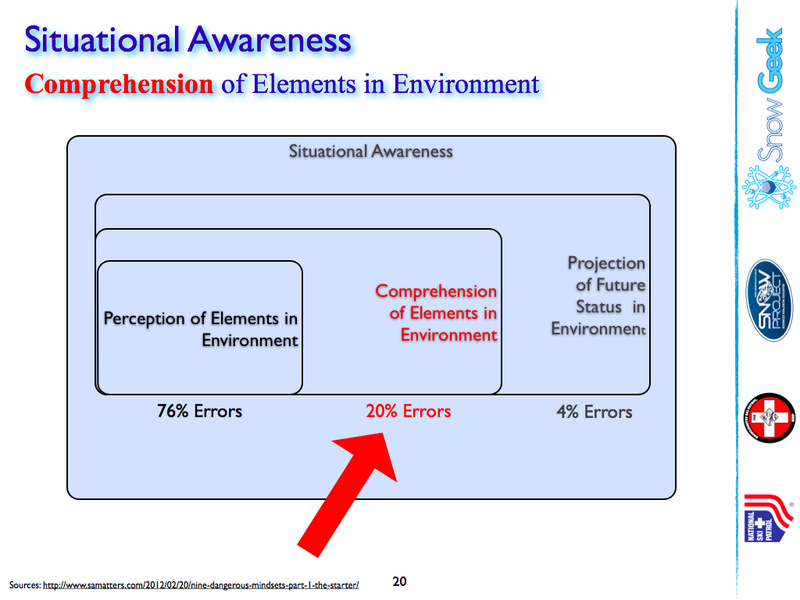 But perception is not sufficient to further reduce human errors, and an additional 20% of errors can be further reduce by better comprehension or understanding of the environment. Spatial variability (thickness and presence) of the basal ice layer at Norterly aspects adds significant uncertainty to the snowpack stability at the 35 cm facet weak layer. This will be exacerbated at elevations at 8000 feet or more. Similar poor stability and poor snowpack structure conditions should be assumed across SW Idaho. Temperature gradients above 1 deg per 10 cm, will continue to affect the snowpack on its entirety reversing the sintering of the slab layers form by this week NEW snow. The melt freeze layer at the 5 cm layer will decompose due to faceting metamorphism driven by the much steeper gradients at the surface of the snow. We should expect the formation of depth hoar at all elevations and aspects above 7500 feet covered by this week snow. The top 5 cm of near surface facets (NSF) will become a weak faceted layer once they get covered by new snow during Saturday's storm. East, South, and West aspects below 7500 elevation have very limited snow coverage, making snow riding dangerous due to buried obstacles. The facets (possibly a thin layer of surface hoar - SH) buried 20 cm deep might become active after the next snow loading event, possibly this Saturday. The loading of the snowpack during the next loading event (Saturday storm) will result in some localized whumpfing, as evidenced by the "sudden collapses" observed in the stability testing this past Thanksgiving Day. After the snow forecasted for Saturday settles, probably by early next week, test results for trigger likelihood will become moderate. The thicker slab will make trigger likelihood less likely, but the consequences will be much higher due a thicker slab, maybe 50 cm, and the barely covered buried ground cover such as rocks, stumps, fallen logs, among other terrain features.